Each year Brad publicly declares his love for his wife, Melissa. He has a tradition of finding a location that can be seen by Melissa during her daily routine. 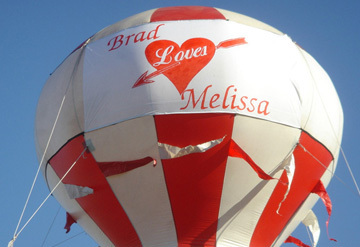 In the past Brad has posted his message "Brad Loves Melissa" on everything from large hot air balloons to the sides of buildings. This year Brad reached out to us at J.R. Dunn Jewelers for assistance with his proclamation of love. Brad asked Sean Dunn, Vice President, if he could use the J.R. Dunn Jewelers billboard on Interstate 95 to publish his message to his wife, Melissa. Sean gladly agreed, after all, J.R. Dunn is in the business of creating things that show people you love them. 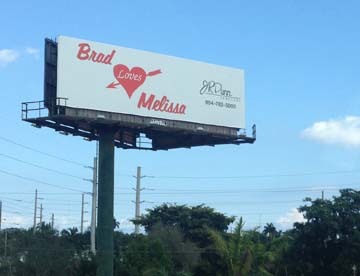 'Brad Loves Melissa' billboard located on I95 near Exit 32 in Fort Lauderdale, Fl. Past Valentine's Day surprises Brad has given Melissa.